Kirkland & Ellis’s work for Deutsche Bank, Volkswagen, Caterpillar and Teva shows how highly the firm is regarded by blue-chip clients around the world. Kirkland’s government, regulatory and internal investigations practice is led from Chicago by Mark Filip, a Who’s Who Legal: Investigations nominee and the DOJ’s former second-in-command. As the deputy attorney general of the DOJ under President George W Bush, Filip had a significant effect on the agency’s white-collar law enforcement, revising the principles it must consider when prosecuting corporations. Kirkland’s Washington, DC office is home to Jay Stephens and William Stuckwisch, both former DOJ officials. Stephens was associate attorney general under President George W Bush. He worked for 13 years at defence contractor Raytheon, after serving for five years as the US attorney for the District of Columbia. Stuckwisch, meanwhile, served as an assistant chief for the FCPA unit in the DOJ’s criminal fraud section. Another DC partner is Neil Eggleston, who left Kirkland in 2014 to serve as White House counsel to President Barack Obama; he returned to the firm in April 2017. Earlier in his career, he served as associate counsel to President Bill Clinton. The Washington, DC-based Edward Liva was recently nominated to GIR’s 40 under 40 2017. Three partners have recently left the white-collar practice to join government. Robert Khuzami, who is known for remodelling the SEC’s enforcement division, including the creation of the FCPA unit, became deputy US attorney for the Southern District of New York in January 2018. Chicago partner and former prosecutor John Lausch became the US attorney in Chicago in late 2017. And in June 2017, the administration of President Donald Trump nominated Brian Benczkowski, a partner in Kirkland’s white-collar practice, to serve as head of the DOJ’s criminal division. Benczkowski previously worked for Attorney General Jeff Sessions when he was a member of the Senate Judiciary Committee, and as chief of staff for former Attorney General Michael Mukasey. Other prominent members of the white-collar practice are scattered in offices across the US – including in Houston, Los Angeles and San Francisco – and in London and Asia. Kirkland has six partners in Who’s Who Legal: Investigations and two in Who’s Who Legal: Business Crime Defence. Satnam Tumani, a former SFO chief of bribery, corruption and international assistance, is a partner in the firm’s London office. He has also been nominated to both Who’s Who Legal: Business Crime Defence and Who’s Who Legal: Investigations. Meanwhile, GIR Women in Investigations-listed lawyer Tiana Zhang in Shanghai is at the helm of the firm’s Asia investigations practice. The firm hired five partners from Ropes & Gray in August 2017, including Asheesh Goel, who was co-chair of the firm’s anti-corruption practice, and who advised Zimmer Biomet on a recent deferred prosecution agreement with the DOJ over repeat FCPA violations. Goel previously led the Chicago branch of the SEC’s enforcement division. Also from Ropes, Zachary Brez joined Kirkland’s New York office; Kim Nemirow joined in Chicago; Cori Lable became a Hong Kong partner; and London-based Marcus Thompson joined the firm. In February 2018, Kirkland & Ellis hired former Clifford Chance counsel Richard Sharpe as a partner in its Hong Kong government and internal investigations group. Partner Andrew Genser became general counsel of Viking Global Investors, a New York hedge fund, in June 2018. The previous month, Cormac Connor left Kirkland for DC-based government contracts boutique Smith Pachter McWhorter. The US Commodities Futures Trading Commission imposed civil penalties on HSBC, UBS and Deutsche Bank in January 2018 for manipulating the price of precious metals futures contracts through spoofing, as part of a first-of-its-kind enforcement action with the DOJ and the FBI. GIR reported at the time that Kirkland acted for Deutsche Bank, which settled for $30 million but neither admitted nor denied the charges. Kirkland also represented Deutsche Bank in shareholder litigation that followed the aftermath of the forex investigation. While five other banks pleaded guilty to charges of manipulating the currency trading market, all enforcement agencies involved declined to bring an enforcement action against the German bank. Instead, the US Federal Reserve in September 2017 fined it US$156.6 million for violating foreign exchange rules. In March 2017, US construction equipment maker Caterpillar announced that it had retained Kirkland & Ellis of counsel and former US attorney general William Barr. Caterpillar tasked Barr with reviewing matters relating to search warrants executed at the company’s facilities, and assisting the company in appropriately addressing those matters. According to press reports, a whistleblower made allegations about the company’s tax arrangements. Another representation that stands out is the firm’s role in the criminal investigations and civil litigation surrounding German car maker Volkswagen’s admission that it used “defeat devices” in more than 11 million of its diesel engines to cheat emissions tests. Volkswagen pleaded guilty to three criminal felony counts and agreed to pay US$4.3 billion in criminal and civil fines in a settlement with US authorities in January 2017. The case has also involved a high number of individual prosecutions of former Volkswagen executives. Kirkland was involved in the flurry of foreign bribery settlements that were announced in the last days of the Obama administration. The firm represented Teva Pharmaceuticals, which agreed to pay US$519 million in penalties in December 2016 to resolve FCPA violations in Russia, Ukraine and Mexico. Filip, Stuckwisch, Khuzami and Cannon all assisted on the case, which was worked on jointly with lawyers at Willkie Farr & Gallagher. Kirkland represents numerous high-profile individuals caught up in white-collar investigations. It was one of several firms advising Reza Zarrab, a Turkish-Iranian gold trader who, faced with DOJ charges over sanctions violations, became a government witness in late 2017 and turned on one of his conspirators, Hakan Atilla. The government sought a 20-year sentence for Atilla, but he received just 32 months’ imprisonment. Paul Clement at Kirkland is representing Macao billionaire Ng Lap Seng in his appeal against a four-year prison sentence for bribing UN officials for their help in sponsoring a conference centre in Macao. According to press reports, Kirkland & Ellis is representing Rio Tinto in an SFO investigation of potential bribery by the Anglo-Australian mining company in connection with its Simandou iron ore project in the Republic of Guinea. The company says it is fully cooperating with the investigation. 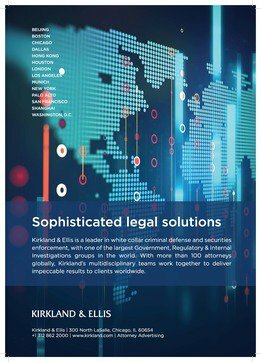 Kirkland’s government, regulatory and internal investigations practice stretches from New York to Shanghai, with major hubs in Chicago, Houston, Los Angeles, San Francisco, London and Washington, DC. Kirkland’s clients include UK oil company BP and auto parts manufacturer Tenneco. The firm has conducted internal investigations on behalf of Pfizer, Semperian PPP Investment Partners, Sensata and Tyson Foods. The firm has represented Bain Capital and American Realty Capital Projects in government investigations. Kirkland boasts a strong track record of defending numerous high-profile corporations in crisis situations. Notably, the firm represented BP after the blowout of its Maconda well in the Gulf of Mexico in 2010, which led to what is considered the largest marine oil spill in the history of the petroleum industry. In October 2015, the DOJ announced that it had reached a US$20 billion settlement with BP to resolve violations of the Clean Water Act and the Oil Pollution Act. The firm advised General Motors following the failure of the auto manufacturer’s ignition switches. The company entered into a deferred prosecution agreement with the DOJ and agreed to forfeit US$900 million to resolve the matter. In the agreement, General Motors admitted that the defective switches had caused 15 deaths. Kirkland has advised on a string of high-profile FCPA settlements over the last decade, including for chemicals company Innospec, power and automations company ABB, insurance brokerage firm Aon, medical device manufacturer Biomet and pharmaceutical company Pfizer. Innospec pleaded guilty to defrauding the United Nations and violating the FCPA and agreed to pay US$40.2 million in March 2010 in a joint settlement with the DOJ and SEC. ABB entered into a series of agreements in September 2010 with the DOJ and SEC and agreed to pay US$58 million to resolve claims it bribed officials at a Mexican state-owned utility company. Aon paid US$16.2 million in December 2010 over charges it paid bribes in Costa Rica, Egypt, Vietnam, Indonesia and the United Arab Emirates, while Biomet entered into a deferred prosecution agreement and agreed to pay US$22.8 million in settlements with the DOJ and SEC in March 2012. Kirkland also acted as counsel for Pfizer during the pharmaceutical company’s FCPA-related deferred prosecution agreement with the DOJ and the SEC in August 2012. The DPA ended in 2014 after the US government informed the company that it had completed the terms of the agreement. Kirkland & Ellis is global law firm with 2,200 attorneys representing clients in litigation, investigations, dispute resolution/arbitration, private equity, M&A and other complex corporate transactions, restructuring, and intellectual property matters. The firm has 14 offices around the world: Beijing, Boston, Chicago, Dallas, Hong Kong, Houston, London, Los Angeles, Munich, New York, Palo Alto, San Francisco, Shanghai and Washington, DC. With confidence, our clients consistently turn to Kirkland’s government and internal investigations group for sophisticated and effective representation. We are uniquely suited to handle the primary and collateral consequences of government investigations, whether pre-investigation prevention and mitigation, internal investigations, defence of a government investigation, or resolution through settlement or trial. Our internationally recognised team includes former senior enforcement professionals from the US Department of Justice, the US Securities and Exchange Commission, and the UK Serious Fraud Office.